Welcome to FlowerFresh the number one online florist shop. 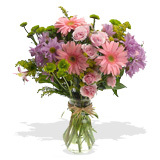 We have a host of floral designs for every occasion in a range of price points. We feature stylish contemporary flower bouquets, and we are experts at making hand-tied rose flower bouquets or a elegant topiary rose flower arrangements. We pay attention to detail when making the simplest of our flower bouquets. We pride ourselves on our exquisite presentation and our premium quality fresh flowers.